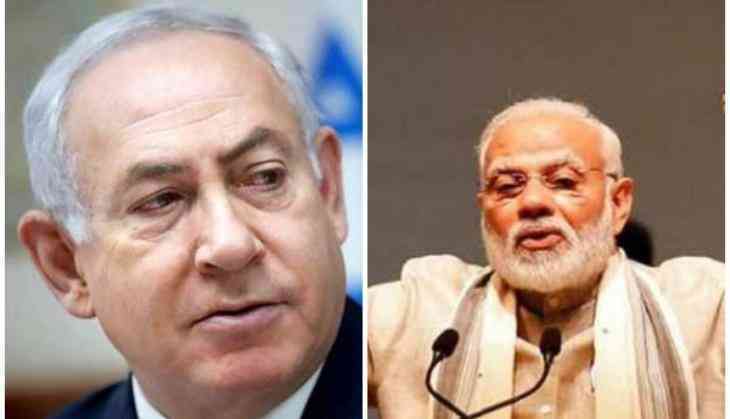 Prime Minister Narendra Modi is set to meet Israeli counterpart Benjamin Netanyahu on Tuesday to elevate 25 years of diplomatic relations between the countries. Ahead of their meeting, both leaders recognised the threat terrorism poses to their countries and to global peace and stability. "Accordingly, a few years ago we signed a landmark agreement on cooperation in the homeland and public security. India and Israel are committed to working together to fight this scourge," the leaders said in a blog post. Prime Minister Narendra Modi's historic visit to Israel commences today and he will be the first serving Indian prime minister to visit Israel to mark 25 years of the establishment of diplomatic ties between New Delhi and Jerusalem. "The 'Make in India' initiative to strengthen the Indian manufacturing base has been enhanced by its Israeli ' Make with India' counterpart. We are pleased that this vision is already bearing fruit. This week's historic visit, as we celebrate 25 years of full diplomatic relations between India and Israel, reflects not just the close cooperation of our governments, but also the great sympathy and affinity between our peoples. We marvel at the changes we have witnessed over the last two and a half decades and are proud that India and Israel are genuine partners for development, technology, innovation and entrepreneurship," both the Prime Minister's said, reaffirmed their commitment to economic ties. Celebrating 25 years of diplomatic relations between the two countries, the leaders further stated, "We are confident that 25 years from now, Indians and Israelis will look back on this visit as the first of many historical milestones that we reached together in the great friendship between our peoples. The natural partnership between India and Israel formally elevated 25 years ago to full diplomatic relations, has grown stronger from year to year. The deep connection between our peoples reflects our many similarities in spirit, if not in size. Ours are two modern, vibrant democracies that draw on our rich historical traditions while striving to seize the promise of the future for our peoples." Taking business ties to a higher level, Leaders stated,"We are establishing a new India-Israel CEOs Forum. Acquiring business visas from each country has become easier today than it has ever been, thanks to steps taken by both governments. We are also asking our respective business leaders to suggest ways in which we can bring our bilateral trade closer to its real potential." In a special gesture, Prime Minister Narendra Modi will be received by Prime Minister Benjamin Netanyahu on his arrival at the Ben Gurion Airport in Tel Aviv today evening.Till now, this gesture has only been accorded to U.S. presidents, including President Donald Trump recently and the Pope. Prime Minister Netanyahu will also accompany his Indian counterpart to all events during his historic visit to the country between July 4 and July 6. The Indian Prime Minister is undertaking a visit to Israel to mark 25 years of the establishment of diplomatic relations between the two nations. In his 48-hour visit, the Prime Minister is attending 18 programmes in Israel. These programmes include bilateral meetings, mega Community Programme, meeting top Israeli CEOs, NRIs, students.On Thursday (July 6) both Prime Ministers will pay wreath on the two grave areas - one is for the Hindu soldiers and one for Muslim soldiers- during their visit to Haifa cemetery," said Israeli Foreign Ministry's Deputy Director General in charge of the Asia and the Pacific Division Mark Sofer during a briefing.